Throughout the year, we'll be running a series of interviews with our Featured Artists. Mina Milk is our latest artist here at Giant Sparrows, and we just can't get enough of her vibrant, dynamic wildlife illustrations.We caught up with Mina to talk about her work as an artist, her recent move to Moscow, and her obsession with wild cats. GIANT SPARROWS: Which of your designs means the most to you? Can you talk a bit about that drawing? 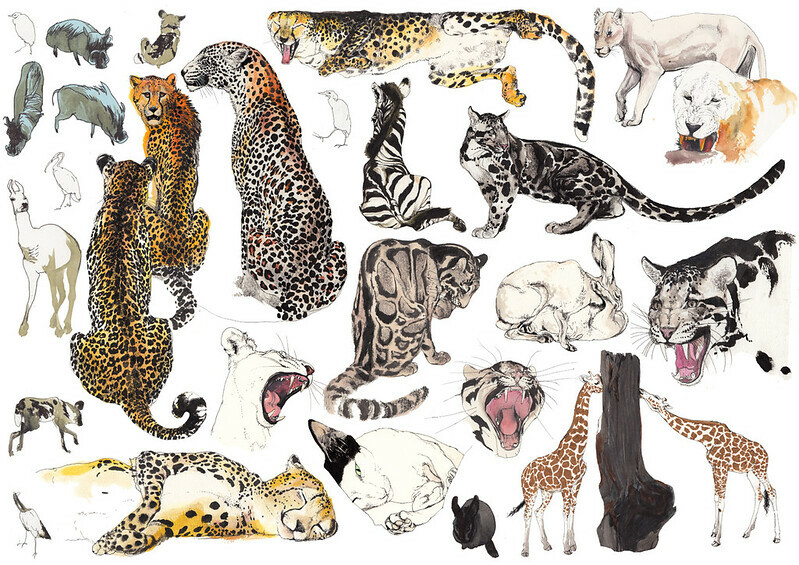 MINA MILK: I think I like the Clouded Leopards best; all of these images were drawn for an educational poster I’ve been working on. I became interested in this elusive cat after looking through photographs from Scientists and Travelers, and found out just how little we know about it. I began collecting all the little bits of information I could find on an A3 sheet of paper, which I eventually illustrated– I much prefer drawing to writing in that way. The poster has lead on to other things as well; I’m now working on a children’s book about wild cats. It’ll be quite interactive, combining coloring-in with other activities that I think are new and fascinating. GS: What’s your background in drawing? When did you first realize you wanted to become an Illustrator? MINA: I’ve been drawing for as long as I can remember; I used to draw on long rolls of wallpaper as a child. As for being an Illustrator– most of the time I don’t feel like one, as I do quite a few things that aren’t illustration, strictly speaking – like window design, visualization of ideas and concepts, etc. GS: A lot of your images are drawn from life; do you always carry a sketchbook with you? MINA: Oh yes, absolutely, drawing is my addiction so I carry bits of paper and sketchbooks with me nearly everywhere! In India, I carried a good combo of a small bottle of ink, a scratchy dip pen and a pile of etching paper; usually it’s less fancy than that. I’ve used about 60 sketchbooks in the last 4 years. GS: We feature a lot of your drawings of wildcats, many of which were drawn from life at the UK Cat Survival Trust's animal sanctuary. How did you first hear about the Trust, and how did you get involved? MINA: It was one of my lucky finds on the web! They listed their address on their website, so me and my friend (who’s also rather passionate about animals) went to visit. On our first trip, we met Dr Terry Richardson, Robert Martin (who's a clouded leopard specialist, what a coincidence!) and Colin Hayden, who were happy to talk about the work Trust does and their amazing cats. So, we became regular guests at the trust and right now we're planning new projects together. GS: What elements of animals do you try and capture in your drawings? MINA: The legs! Joking, not necessarily. All living this are a treat to draw. I like to simplify them to a point when they’re both quirky and recognizable. I wouldn’t don’t want to make perfectly realistic drawings (mostly, I fail the anatomy); instead, I want to make the most interesting things about each subject visible to others. GS: What’s your work space like? Do you currently have a studio setup, or do you work from home? MINA: My workspace is a desk, a bit of the floor, and a couple of shelves. I currently work from home – I’ve just moved to Moscow from London, and as we rent such a large place I basically have my own room for a studio. I used to rent out studio space for larger projects, which is quite fun and useful too! GS: Do you ever draw animals in the wild? MINA: Not yet, unfortunately; my current location doesn’t provide much of a wild to draw in. But if Cows from Goa and Elks in London’s Richmond Park count as wild animals, then yes I have! I much prefer life drawing to other ways of capturing something in detail, so I’m a regular at the zoo. Because it’s so chilly in Russia, I only sketch outdoors, and finish my drawings later, enjoying the luxury of constant central heating we get in Moscow from September. GS: Have you ever felt in danger when drawing wild cats? MINA: I havn’t had the chance to draw them in the wild yet, although I might get one soon; I’m travelling to Sri Lanka this year, where there’s a good population of leopard. Even the zoo cats can be quite threatening though – at the Cat Survival Trust, the fearsome Amure Leopards scare me to death every time I visit. They hide and pounce, growling, or follow you and leap against the fence when you least expect it. There’s two of them there, and they’re the mot beautiful cats I’ve ever seen; but they want to kill the keepers and me so badly that you feel torn between admiration and spine-chilling fear. GS: Who are your influences? What other artists inspire your work? MINA: I’m far from unique here; I love Egon Schiele and Gustav Klimt. I also love Vasily Vatagin, a Russian artist and scientist, who did amazing illustrations on animal psychology. But really my art is more about primary research; I look at animals themselves, not their representation in art. GS: Aside from your personal work, what’s your favorite project you’ve worked on? MINA: It’s so hard to choose, to be honest! I worked with clothing brand Diesel a few times, and I really liked our shop window project. Our team had a theme, “Diesel Island Jungle”, which we translated into a window design by creating an entire cardboard forest. We hand-drew and carved everything ourselves, and built it up layer by layer surrounding the mannequins in each window. Great fun! The finished window of the "Diesel Island" project. GS: Do you have any plans for your work in the future that you’d like to talk about? MINA: Too many! I want to do a good solo show here, in Moscow. I’d also like to work with environmental protection organizations around the globe, as well as finishing my book on cats and continuing all my other ongoing projects. I've really enjoyed working on my Ceramic Bowl project, and will be making more to sell in my Etsy Store! Right now, I really want to travel, as nothing inspires you more than things you’ve never seen before. If you're interested in finding out more about the work of The Cat Survival Trust, you can find their website here.